It's our miniature schnauzer's birthday today (Happy 13th Birthday Molly!). I thought she'd like a new collar, but she's definitely not the diamante kind of girl. Luckily, Brisbane-based PretaPawte make very stylish collars for dogs and cats that are less about the bling factor and more about the chic factor. 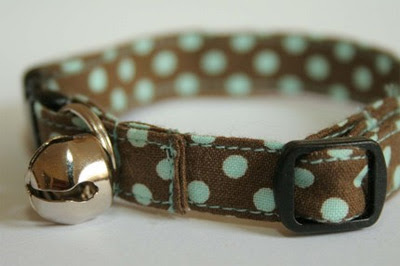 PretaPawte uses 100% cotton designer fabrics and durable hardware and cat collars come with a jingle bell. The only trouble is trying to pick one! 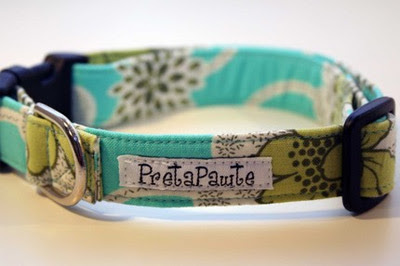 You can find PretaPawte pet collars on Etsy and at various markets. Read more about Pretapawte's latest designs, market appearances and cool finds for pets on the blog. And you can become a PretaPawte fan on Facebook. Oh wow so pretty, if only my beagle could wear one. I'm sure he would cover it in dirt and manage to acrobatically chew it off though. Oh, very cute! Happy Birthday Molly. Pixelhazard - I love the sound of your beagle. Too funny! Alison - Molly says thank you! And love to Gypsy too.